The natural urge or human exploration and ambition is to go where few others have gone before. For some it is to reach the deepest seabeds of the oceans. For others it might be the polar extremes of our planet. And for some, the call leads to the highest peaks to witness the awe inspiring views that await. The Rocky Mountains are replete with some of the most transcendent views in North America including Mount Nebo, Pikes Peak, Kings Peak, Grand Teton, Cloud Peak, and the pride of Colorado, Mount Elbert. The journey is grueling and the pathway dangerous, but the view from the top makes it all worth it. Nolan Arenado spent four years dawdling in the valleys of the Rockies, hearing tales from teammates about the experiences of Mount World Series, despite the crash and tumble just before the summit. Then in 2017, Mount Wild Card was conquered, but the stay at the summit lasted so briefly, you wonder if Nolan even got a picture. Did it really even count? Maybe next year. The marathon trek in 2018 once again brought Nolan Arenado back to Mount Wild Card. This time he reached the summit, but only aided by fellow mountain climber Kyle Freeland, who carried the heaviest backpack load, and Tony Wolters, who managed to knock that snarling bear cub down the mountainside. Mount Wild Card was conquered again. And Nolan had the picture to prove it. Mount Wild Card is not the goal for 2019. For Nolan, Charlie Blackmon, Trevor Story, German Marquez and the rest of the team, it’s already been done. The view has been witnessed, the vision unfolded, the summit reached. But there are bigger peaks to conquer. And while Mount Wild Card was conquered in 2018, Nolan and company stumbled before the summit of the most nefarious and cruel mountain once again. For 2019, Nolan and company must conquer Mount Dodger. Thrown down the mountain at the base of the summit by Walker Buehler‘s fastball, the journey for this year goes through that peak. Mount World Series lays beyond, the ultimate goal for the Colorado Rockies and the highest of peaks. But Mount Dodger, however, might just be the sweetest of heights to conquer. For now. What is the Rockies’ most recent accomplishment? It’s easy to see the 2018 season as a huge success for the Colorado Rockies, despite losing the division to the hated Dodgers in Game 163. For one, the Rockies made the postseason in back-to-back seasons, something that they’ve never done in their history. 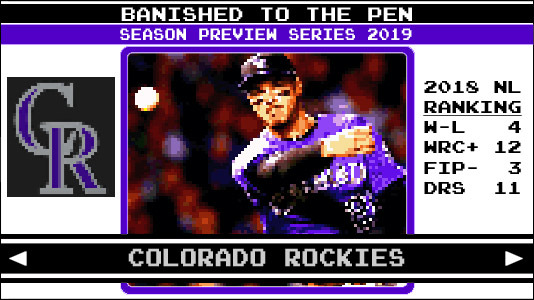 Second, the biggest weakness of the Rockies franchise has become a strength. Although the bullpen at times was a bit shaky, the starting pitching more than made up for it, leading to a well above league average pitching staff that pitched to a 108 ERA+. The Rockies only used six starting pitchers for 162 of their 163 games. The 2019 season has a lot to build on. How will the Rockies define success this season? After back-to-back playoff appearances, a trip to the Wild Card game is not enough. For the 2019 season to truly be a success, they need to take the division and that means downing the Dodgers. Sam Miller introduced us back in 2013 to our favorite Effectively Wild Rockies player. Meet Mark Reynolds, the man who not only embodies the three true outcomes so many of Effectively Wild fans love to follow, but somehow does so while blind. He may have the ugliest swing on the team, but when you realize he hits dinger after dinger after dinger while blind, then you should see what makes him so special. Because he can’t. Because he’s blind. Probably. There are three games that all Rockies fans should look forward to more than any other if they plan on visiting Coors Field. The 2019 season brings us the bobbleheads of three of Rockies fans’ favorite players: MVP candidate Trevor Story (Sunday, June 30th), best-beard-in-baseball owner Charlie Blackmon (Sunday, July 14th), and hometown hero and pitching ace Kyle Freeland (Sunday, August 4th) who, if you haven’t heard is from Denver, well, now you have. Mark your calendars!